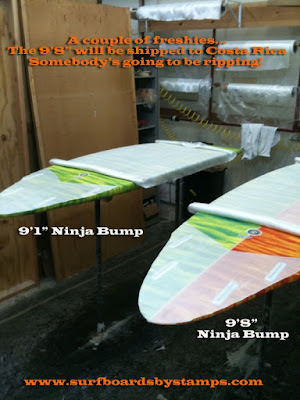 Stand Up Paddle Surfing: Last of the Build Photos... because I'm picking it up tomorrow! Last of the Build Photos... because I'm picking it up tomorrow! Photo: Cool to see two of these getting done at once... and how rad is that spray on the 9'8"? I'd love to see a couple of photos of that big one in action so if you're the owner, send a couple my way! Pura Vida! Photo: Six weeks start to finish... Thanks Stamps! You gotta come up to 'da Shores and show them off to us John! P.S. 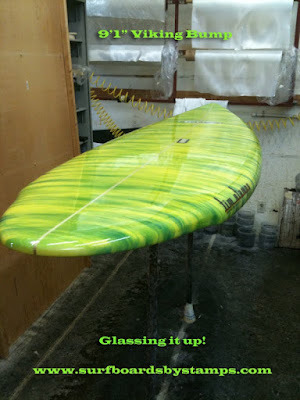 I just put a tri-fin set of blue Gerry Lopez SUP fins on my 7'8" and am loving it! Great to hear from you, hope you all up at the Shores have been getting some good ones this winter. I'd be happy to show it to you- I'm pretty excited about it... shorter, different outline and light. Now I just need a good, clean (and smaller) day to try it out. Got myself a new one! Hooked SUP: Alex Aguera's Omilu... fish tacos? More Oaron goodness: SoBa Surf Shots! Something on my mind: Prop Fin!